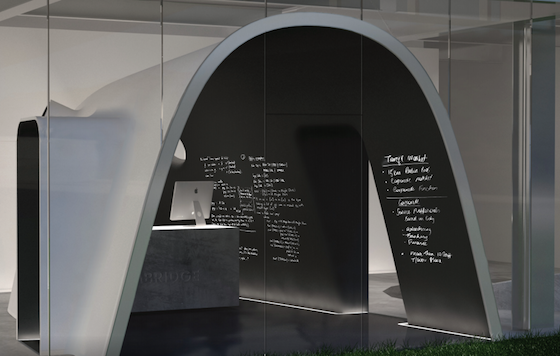 It won't open until early 2014, but there's a fascinating new project percolating in Kendall Square: The Lab Cambridge, a gallery and workspace intended to be a supercollider for artists, scientists, students, and entrepreneurs. It's a project of Harvard professor and entrepreneur David Edwards, with financial backing from two local venture capitalists, and it'll be located in the ground floor of 650 East Kendall Street, near Kendall Square's skating rink and the Genzyme tower. The Lab Cambridge will include work space, an exhibition space, a small auditorium, a store and a café, Edwards says. It's the American incarnation of Le Laboratoire in Paris, which Edwards opened in 2007. In Paris, Le Laboratoire "has a lot of open space," says Terry McGuire of Polaris Venture Partners, one of the backers of The Lab Cambridge. "It can sometimes feel like a gallery, but there's also the lab component, where people are trying new things. There's a store, so people off the street come in to try things, and give real-time feedback. It's this very open, experimental site." Students come from around the world to work on transforming ideas into prototype products, and Edwards regularly invites artists, performers, and scientists to collaborate on exhibitions. (One recent show used high-speed cameras to capture dancers in action, a 21st century update on the work of Doc Edgerton.) Flagship Ventures' Noubar Afeyan, another supporter of the new Lab in Cambridge, says Edwards is interested in "creating a social face for an innovation lab that is making things intended for consumers." The Arlington architecture firm Brown Fenollosa is designing the new space, with involvement from French designer Mathieu Lehanneur, a frequent Edwards collaborator. According to a promotional brochure for the project, "The Lab Store will sell innovative designs facilitating environmental sustainability and better human living." Inside the store will be the "WikiBar," where visitors will be able to sample foods wrapped in edible skins and shells, made by Edwards' Cambridge startup Wikicell. The Lab also will host "educational experiments" for Boston Public School students. Clearly, The Lab is going to be an interesting addition to Kendall Square, where not much culture happens outside of petri dishes, and where all of the innovative work takes place behind locked doors, an elevator ride away from the street. Here's a blog post from investor (and former Edwards student) Hugo Van Vuuren about a prototype of The Lab Cambridge, which was based at Harvard. Earlier this month, I profiled Edwards in the Globe.